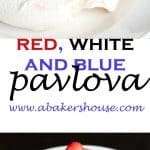 You are here: Home / Dessert / Patriotic Pavlova in Red, White, and Blue! Patriotic Pavlova in Red, White, and Blue! 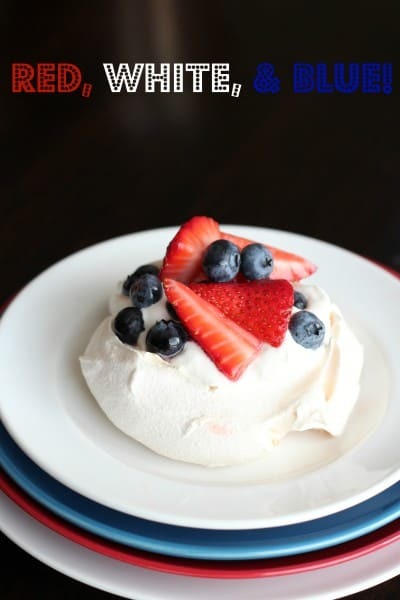 Patriotic Pavlova is an easy dessert to make for the Fourth of July or any other patriotic occasion. A simple meringue topped with cream and berries captures the essence of summer living. Pavlova is something I first tasted when my mother-in-law made it on one of our visits to England. It was a delightful surprise to find the chewy meringue topped with freshly whipped cream and macerated berries. She shared with me the secret that this playful dessert is perfect to serve to company because of its ease to make and the ability to bake the meringues ahead of time. You can make one large meringue that you then cut into pieces or I like to make individual sizes so that everyone can add toppings and create her own masterpiece. For the Fourth of July try this Red, White, and Blue creation with whipped cream (yes, you’ll want to use fresh cream and not the stuff that you squirt out of a can for this dessert) and berries. Fresh berries are abundant right now and, if you have time, macerate them before topping the meringues. Macerating berries is a fancy way to say that you let the berries hang out in a bit of sugar and their own juices first. Here’s a quick reminder if you need it. So simple yet so good. Start with this recipe from Better Homes and Gardens to make the meringues which are your base for the pavlova. Prepare the meringues ahead of time and store them in an air-tight container for up to a few days. Top with your freshly whipped cream and berries and you are ready to celebrate! Do you need more patriotic colors for your dessert table? Red, white and blue decorated sugar cookies in star shapes are a festive addition. Or dress up a typical chocolate chip cookie recipe with these dried berry and white chocolate chop cookies. 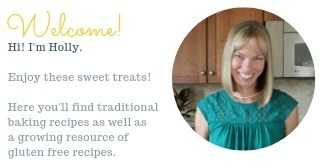 Such fun to incorporate colors into your baking! I make a Pavlova that uses 3 larger meringues that are brushed with chocolate and then stacked with whipped cream and berries. Truly a favorite dessert and these look so perfect for the holiday Holly! Yes, I can picture just the dessert you are talking about– a real show-stopper! I have only recently fallen in love with meringues. I love the crisp and sweet taste that they give to any dish. When I was in South Africa they were the dessert of choice. Kind of like cake here. So good, Holly! I doubt I could give up cake for these but it would be a tough call. : ) I really like how you can vary the toppings and make a completely different dessert.